Temples are generally sacred places for Thai people. While inside, it is a must for visitors to imitate or emulate the way local people conduct themselves. 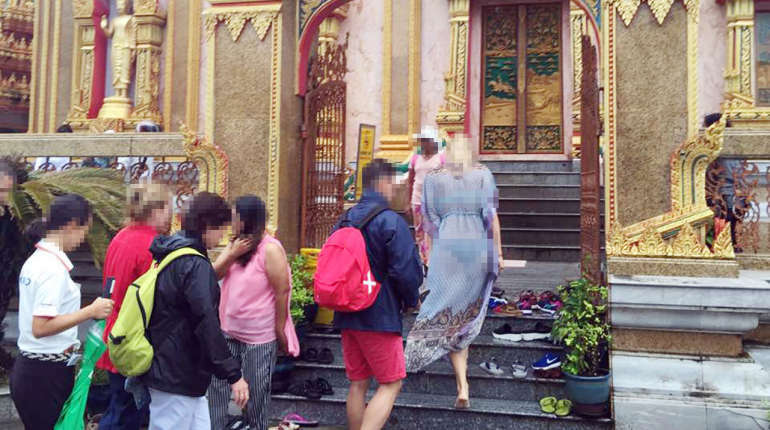 Phuket, Thailand – A Western woman wearing revealing see-through clothes caused a stir and angered Thai visitors yesterday at Wat Chalong, Phuket’s largest and most revered temple. The woman wandered around – oblivious to the distress she was causing Buddhist who were trying to concentrate on religious matters, Thairath reported. Some people took photos of the woman in question for authorities to call for action. Chinese tourists normally have their pre-wedding photos taken at Wat Chalong. When couples start to be more intimate by kissing and holding on to each other – a practice forbidden in sacred grounds such as temples – officials are usually around to tell them to stop. But in the case of the Western woman, no one dared confront her. If you’re visiting a Thai temple, dressing appropriately is the number 1 rule. Show some respect to a place of worship. Wear pants or shorts that cover your knees, avoid sleeveless tops, and remove your shoes when entering worship areas.